Arborvitae is routinely planted by green industry professionals and homeowners as a landscape ornamental. Planted in rows, arborvitae provides dense screening for privacy and border establishment. When planted as a specimen tree, they can be a center piece of any landscape. Due to their ubiquity on the landscape, arborvitae is often maligned as an unremarkable plant. Poor-quality nursery stock, bad planting techniques and aggressive pruning are an unfortunate consequence of their popularity, but this is true for any oft-planted landscape ornamental (e.g. boxwood). Arborvitae and cedar are loosely used common names in commercial horticulture, but mostly refer to species of Thuja. Despite being referred to as cedar, members of genus Thuja are not true cedars; those belong to genus Cedrus. In our region, the most common species of arborvitae in commercial use is northern whitecedar (Thuja occidentalis). Two cultivars in particular are especially popular: ‘Nigra’ (Dark American) for its fast growth and dark green color that persists through the winter months and ‘Smargd’ (Emerald Green) for its tight, columnar habit that creates a dense screen. Western redcedar (T. plicata) and Green Giant arborvitae (T. plicata × standishii) are less common but still abundant on the landscape. Atlantic whitecedar (Chamaecyparis thyoides), meanwhile, is not routinely used because of its need for wet soils as an obligate wetland species. One reason why species of Thuja are so popular in commercial horticulture is their resistance to insect and disease problems. Thuja species allocate significant resources to defense, and as a result, these trees can live for hundreds of years in their natural settings. The wood is very decay-resistant and is prized for building materials that are subjected to harsh climates. In addition, they can exhibit fast growth, resist drought well in most cases and have dense, overlapping branches of lustrous green needles. Despite all this, Thuja do suffer from pest and pathogen issues in the landscape. 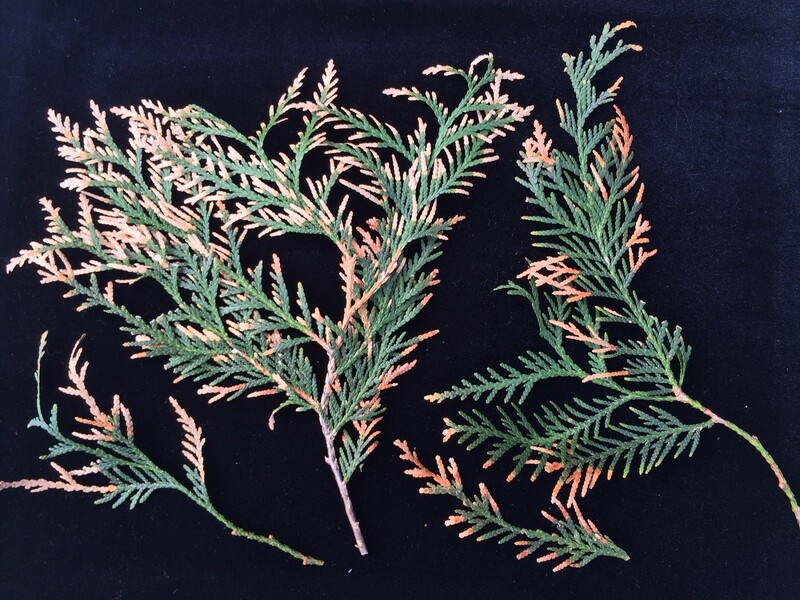 Over the past several years, arborvitae needle blight has become a significant threat to the long-term health of many trees in the landscape. Based on samples submitted to the UMass Plant Diagnostic Laboratory  (UMPDL), the needle blight is primarily the result of infection by two fungi: Phyllosticta thujae and Pestalotiopsis. Little is currently known about the biology and ecology of Phyllosticta thujae. It was described as a new species in 1989 and is believed to occur only on species of Thuja. However, based on submissions to the UMPDL, this pathogen also appears to infect Leyland cypress (×Cupressocyparis leylandii), falsecypress (Chamaecyparis spp.) and juniper (Juniperus spp.). Plants infected by P. thujae typically have blighted needle tips and/or discolored (pale green to yellow) needles that may appear desiccated. Infections often initiate at the needle tip and progress towards the base. During wet and mild weather, black pads of fungal tissue (pycnidia) rupture through the epidermis on symptomatic needles to release large volumes of spores (conidia), which are then blown or splashed to nearby shoots to initiate new infections. Because arborvitae have dense canopies, especially those that are sheared, ideal conditions exist for development of the pathogen. Most infections likely establish during wet weather in the spring, when new needles are emerging and are not fully developed. 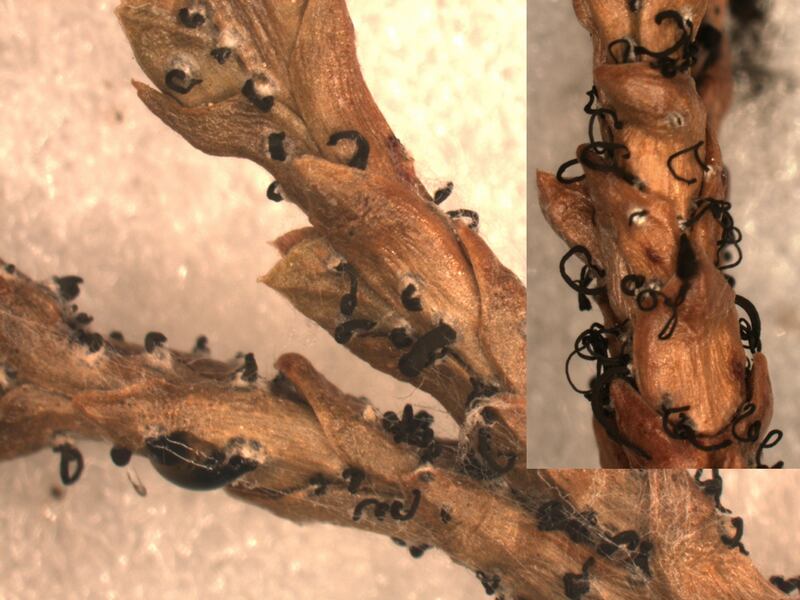 Overall, many Phyllosticta species are poorly understood and are mostly treated as secondary pathogens on conifers. Aggressive pruning and winter injury are likely the two most important predisposing stresses that lead to infection. Since 2014, the UMPDL has received 69 samples positive for P. thujae from four host genera (Thuja, Chamaecyparis, ×Cupressocyparis and Juniperus). 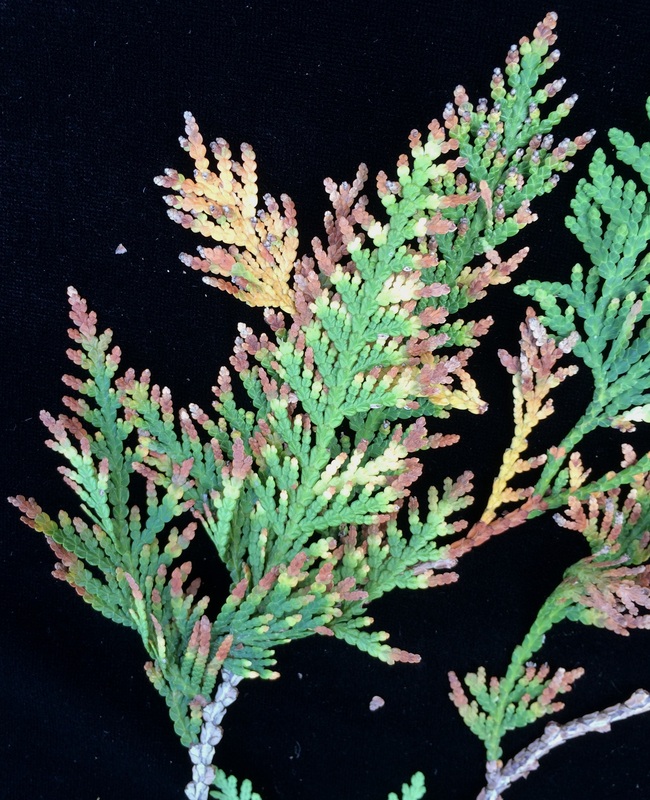 Pestalotiopsis (pronounced Pesta-low-she-opsis) is a common pathogen on coniferous trees and shrubs in landscape settings, causing shoot and branch dieback on numerous species and varieties of Thuja, Chamaecyparis, Cryptomeria and Juniperus. The fungus invades the plant at the tips of new shoots, or can utilize pruning wounds as a source of entry. Once established, it causes browning and dieback that can eventually kill small branches. Overall, Pestalotiopsis can likely be described as more aggressive in comparison to Phyllosticta because of its ability to attack stems and small branches. Phyllosticta, meanwhile, is primarily restricted to the needles. Pestalotiopsis is opportunistic and attacks weakened plants pre-disposed by drought, insect feeding, mechanical damage and establishment stress. The fungus is a known endophyte, meaning that it can live dormant within the plant without causing disease, an adaptation that allows it to readily overwinter in asymptomatic plant tissues. 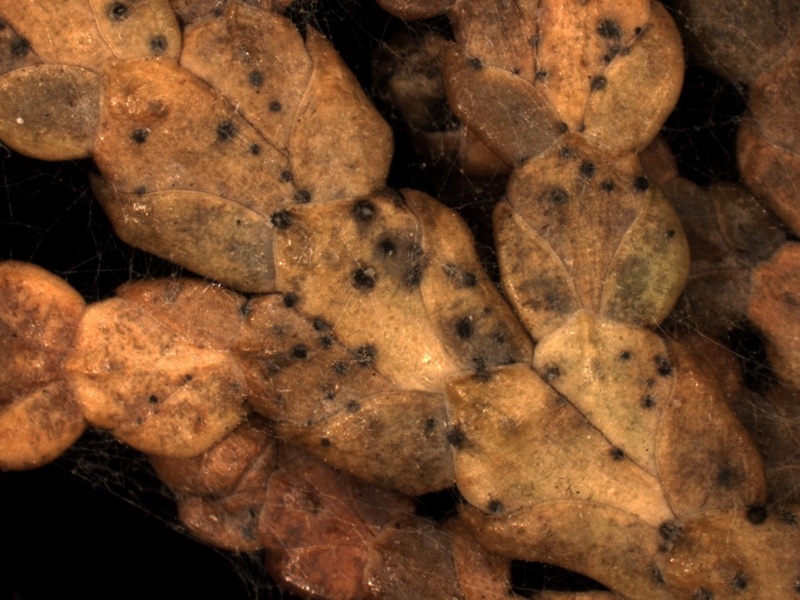 Pestalotiopsis produces small pads of fungal tissue underneath the epidermis, and when moisture is abundant the pads ruptures through, producing a long black mass of spores. During wet weather, spores are blown and splashed onto healthy, nearby plant parts, initiating new infection centers. The best course of action for management of any needle and shoot blight pathogen is to prune and discard as many infected plant parts as much as possible. Dead shoots and needles harbor the fungal pathogens and allow them to overwinter in the tree canopy. When they sporulate from the dead tissue the following year, the spores are in very close proximity to newly developing and susceptible tissues. On well-established mature trees, this level of pruning can be a daunting task, but a necessary one if the disease is to be successfully controlled. In addition, removal of discarded needles around the tree is also helpful. However, it is important to keep in mind that spores travel long distances and both Phyllosticta and Pestalotiopsis are widespread in the environment. Avoid pruning during wet weather, as this is the time period when the fungus is most actively producing and disseminating spores. Also, watering with sprinklers or sprayers that wets the foliage, leaving free moisture to linger on the needles can facilitate spore production and germination. Drip irrigation or hand-watering of newly planted trees is preferable. Chemical management may be warranted in certain cases, such as when trees are recently planted and are undergoing transplant shock. Fungicides labeled for use on ornamentals in Massachusetts that may have utility against both pathogens include: chlorothalonil, copper hydroxide, copper salts of fatty and rosin acids, thiophanate-methyl and mancozeb. Fungicides should be used as a preventative measure to limit infections on the current year's growth in the spring. Chemicals will have a reduced impact on fungal pathogens later in the growing season. Proper spacing and planting techniques can alleviate some of the predisposing stresses that allow infections to establish on trees suffering from transplant shock. Arborvitae can tolerate some shade, preferably in the afternoon, but prefer full sun to thrive. Therefore, proper placement of arborvitae in the landscape is critical in avoiding a disease outbreak.